Good Monday to you! I’m super excited to bring you My Little Plumcake’s first ever free blog tutorial. Once we decided that The Sophie was going to be the spotlighted pattern for January, it didn’t take us long to figure out which tutorial we wanted to do. Michelle has been aware of the desire for a hood for this pattern and we’ve decided to give the people what they want. This is a really simple add-on that we know you’re going to love. An article of clothing you already have with a hood you like the fit & shape of. For fabric, refer to the pattern for the base amount of fabric for the size you’re making. 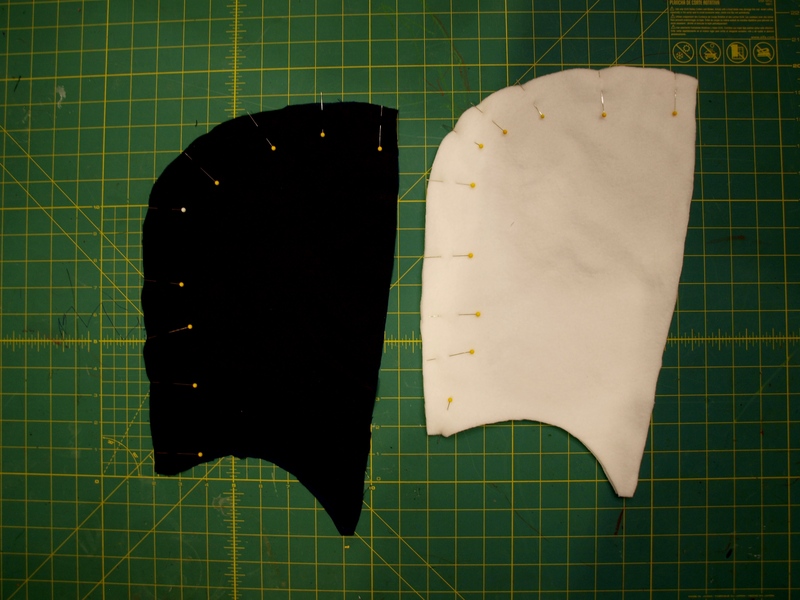 This amount is based on using the collar piece, but since we’re making a hood, it’s going to be slightly different. The hood piece I made for the 5T is 15” at the tallest point and 9” at the widest. 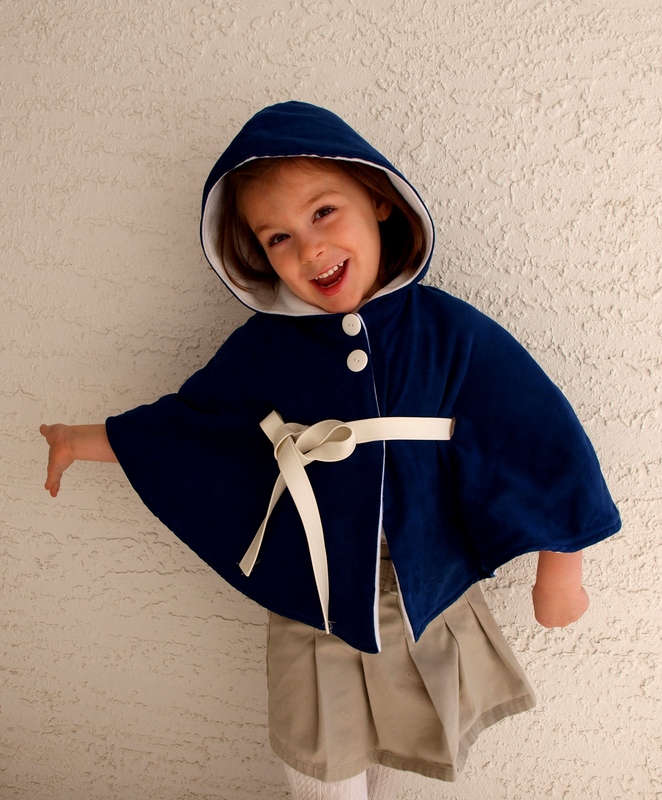 You’ll need enough fabric to cut 2 of each (main, lining, and fusible fleece should you use it), so make sure you have at least ½ yard extra reserved for the hood after cutting your main jacket pieces. You’re going to follow the instructions as written right up until the collar portion. At this point you’ll have your main jacket panels and your lining panels sewn together into two pieces. Now it’s time to draft and construct the hood. We have provided a free size 5T pattern download which was made using the pattern I hand drafted for this tutorial…just digitized and professional. If this is the size you’re making, your life just got easier. Here’s the Sophie Hood Digital pattern for the 5T! 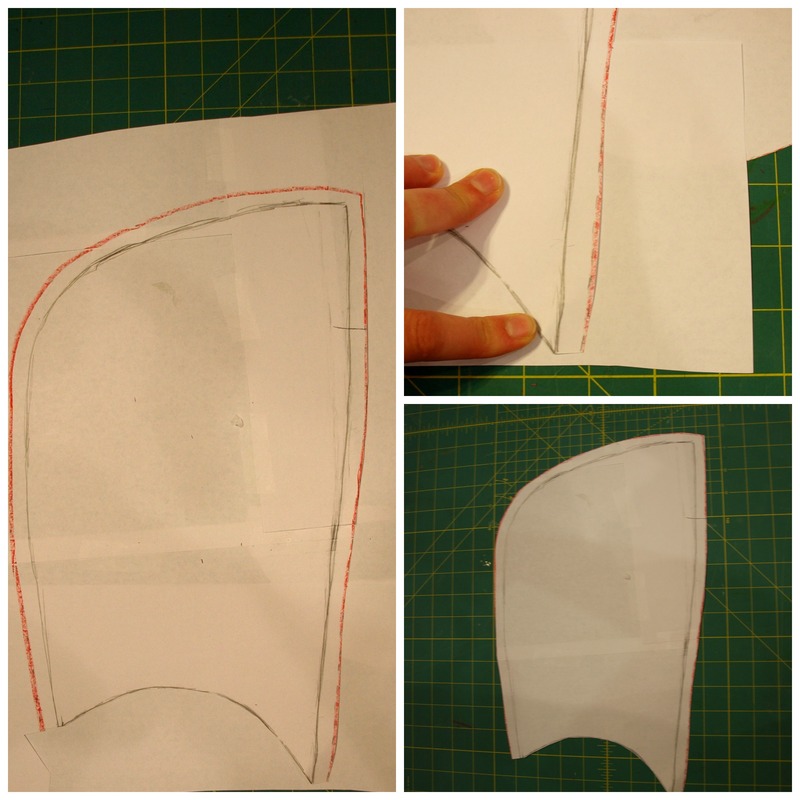 If you’re making a different size, no worries; I’m gonna show you how to make your own pattern. Let’s go! 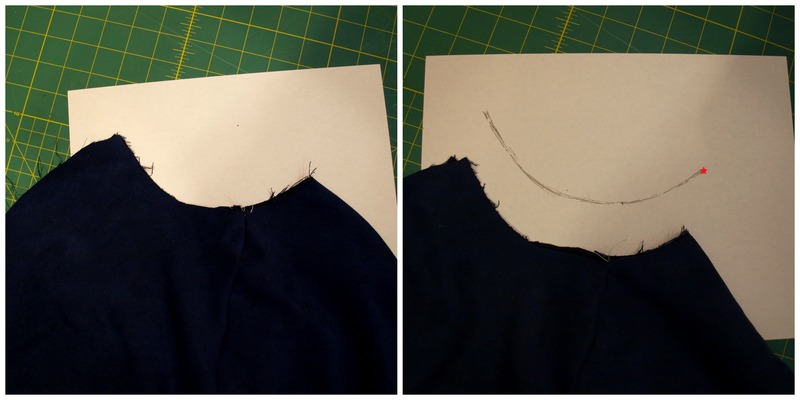 Take your main jacket piece and fold it in half along the neckline. Lay this down on a piece of paper to trace the curve. I mark the side with the fold so I don’t forget which side is which. The fold side is the BACK of your hood. Now flip this curve upside down and start adding extra blank pages upward to expand your canvas. I forgot to take a picture of this so…. Grab your hood that you love. Fold it in half and get ready to trace. 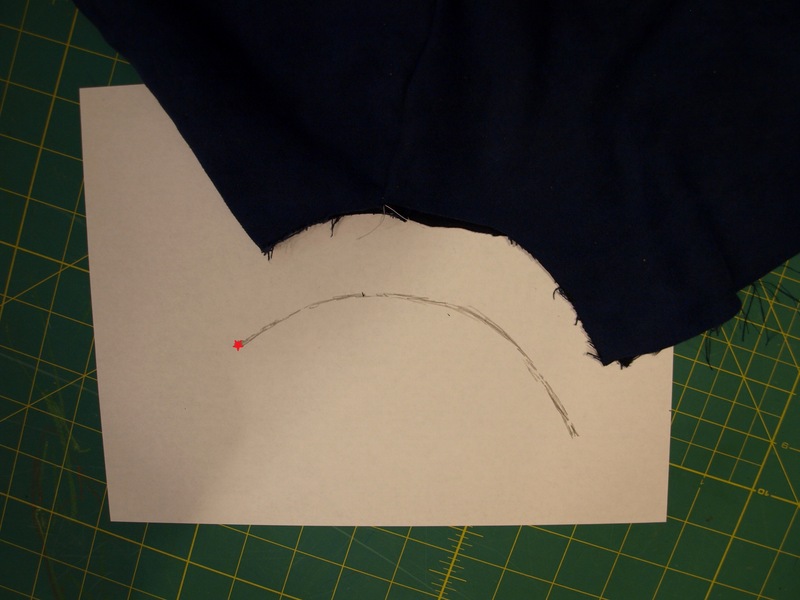 You will be tracing all around your hood making sure to have the folded edge placed on the side you have marked. The seam should lay on the line you drew. You’ll notice on my picture that I made my hood taller. The reason I did this is for aesthetics alone. 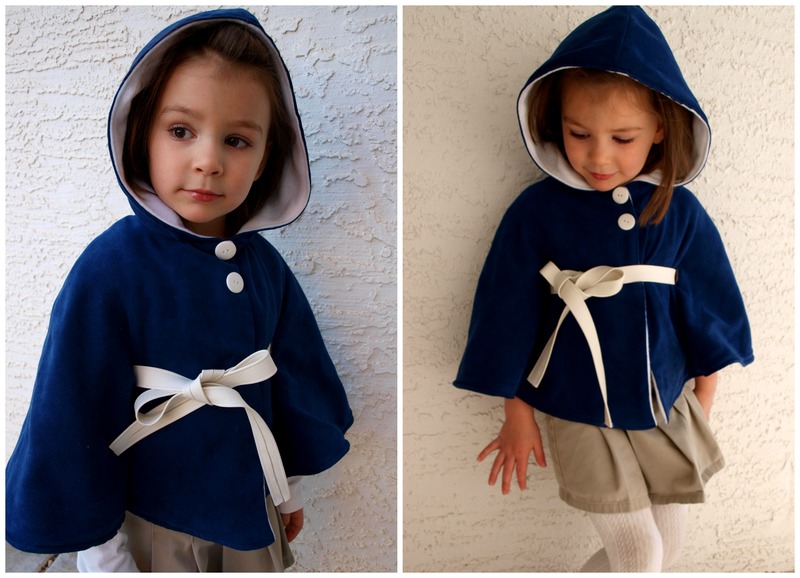 I know this hood fits my daughter well (from The Canaan blazer pattern), but I wanted something that had a softer look with more of a draped hood. The more you extend the top, the more of a drape you’ll get. After you trace the pattern add your seam allowance all around with the exception of the bottom, where the hood will attach to the neckline. The bottom edge points should be squared, NOT pointed. Now cut the pattern out. 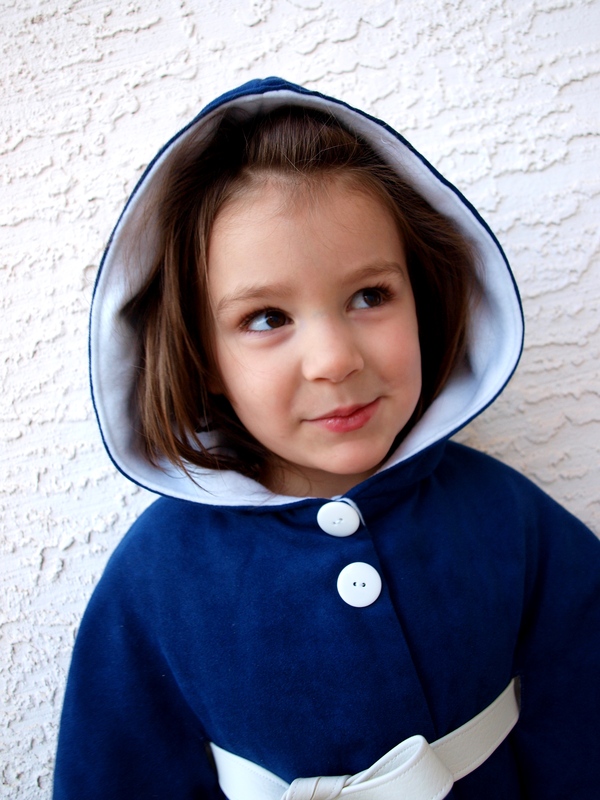 If you are using fusible fleece, apply it to your main fabric per manufacturer’s instructions before moving on. 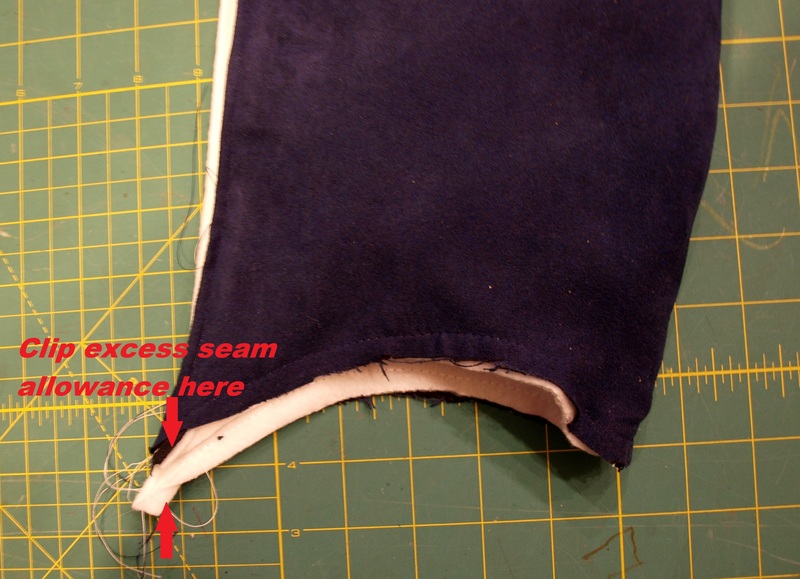 I used normal fleece as my lining fabric, so I only cut 2 main & 2 lining…just to clear that up. 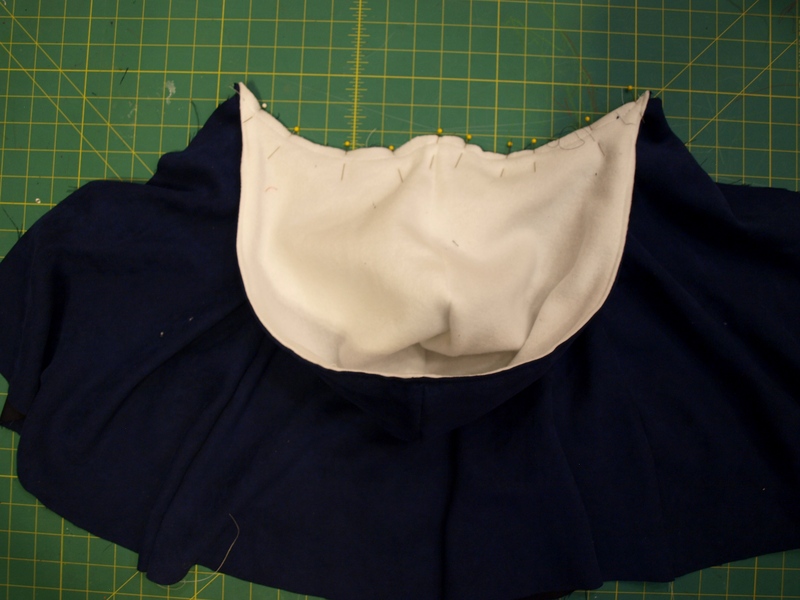 Put your main hood pieces right sides together, pin and sew starting from the top front and going all around the back. Do not sew the front closed! 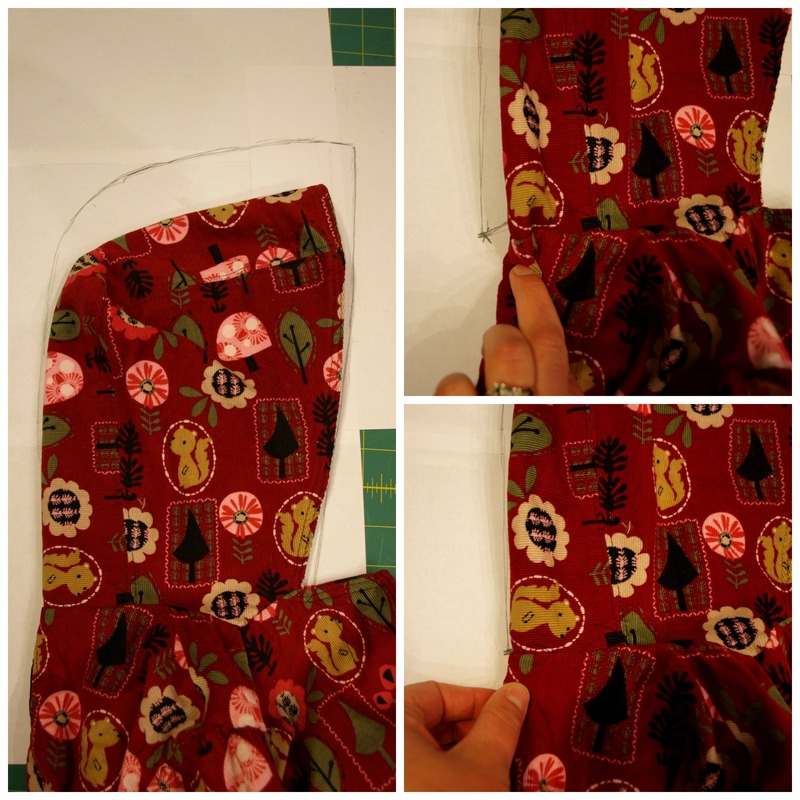 Clip your curves and turn the LINING piece right side out. Place your lining inside of your main hood RST and sew the front closed, starting from the bottom edge of one side and continuing to the bottom edge of the other end. Do not sew the bottom closed. Now turn right side out and top stitch the front of the hood. Baste the bottom edge closed and cut off any overlapping seam allowances on the ends. Fold the main jacket piece in half and mark the middle point of the neckline. 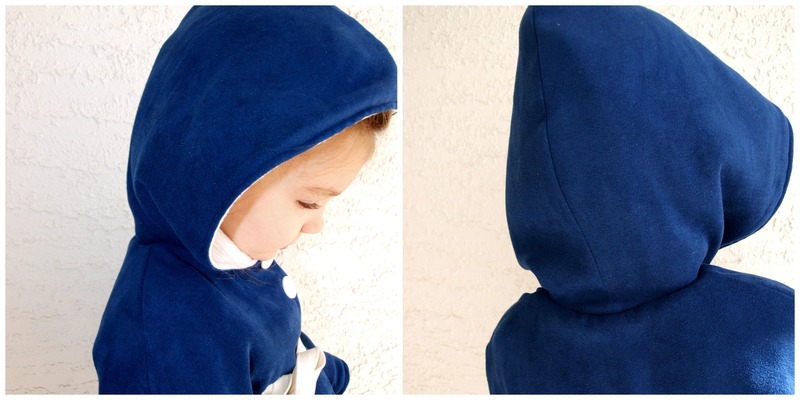 With right sides together pin the base of the hood to the neckline of the main jacket, starting at the center by lining up the seam of the hood with the mid-point if the jacket neckline. Baste this in place using a ¼” SA. Now continue sewing as instructed in the Sophie tutorial. The only deviation from the original tutorial from this point on is that you’ll need to clip the curves after you’ve sewn the hood on between the lining and the main. This will make for a cleaner seam finish. That’s it! I hope you enjoyed the heck out of this tutorial and thank you so much for your purchase of the Sophie. Feel free to comment below with questions or outpourings of love and admiration 😉 And we love to see pictures of your finished projects! You can share them via linking in the comments or uploading to either our FB fan page or our FB group page.